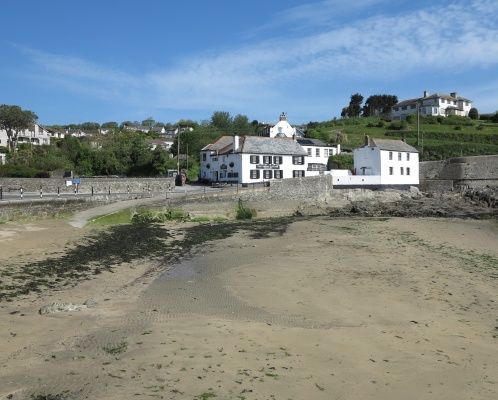 Portmellon is a small sandy cove with slipway. Parking and toilets are in Mevagissey (a 10 minute walk from Portmellon). There is plenty of sand at low tide, but the tide comes in very quickly. See Beach Safety Guide. Final access to the beach is via a slipway. Dogs banned on Portmellon Beach from July 1 to September 30. Portmellon is 6 miles from St Austell. Approaching St Austell on the A390 turn onto the Mevagissey Road the B3273. Follow this road to Mevagissey and park at Mevagissey. Walk the coast road south to Portmellon (takes 10 minutes). No car park at Portmellon apart from the pub car park which is for patrons only. There is limited road parking at Portmellon. There are 4 car parks at Mevagissey. No toilets at Portmellon.There are toilets at Mevagissey.